Barron Avery leads the firm's national Government Contracts team, which consists of a group of core attorneys dedicated to counseling and representing clients in the government contracting sector. In his practice, Barron counsels and represents government contractors and subcontractors in a wide range of matters involving all aspects of federal government contracting. With substantial knowledge of the rules and regulations that drive the government contracts industry, Barron provides knowledgeable day-to-day advice and counseling to government contractors. Complementing his counseling practice, Barron has extensive experience litigating matters on behalf of government contractors and subcontractors. Barron regularly brings and defends bid protests at the Government Accountability Office (GAO) and the Court of Federal Claims (COFC), representing clients in a wide range of industries. 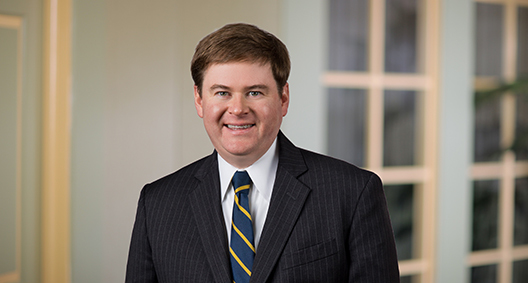 He also has particular experience litigating contract disputes before the COFC and boards of contract appeals, particularly the Armed Services Board of Contract Appeals (ASBCA), the Civilian Board of Contract Appeals (CBCA) and the Government Accountability Office Contract Appeals Board (GAOCAB). Additionally, Barron applies his knowledge and skills to his role as Co-Chair of the International Institute for Conflict Prevention and Resolution's Government and ADR Task Force, which aims to educate corporations on the specific requirements for engaging in ADR with target government agencies. Defended a security services contractor in litigation at the CBCA arising from the Department of Energy’s termination for default of contractor, representing client through procedural motions that resulted in the reversal of the termination for default and a favorable settlement. Represented a major construction firm at the CBCA in litigation related to the construction of facilities for the U.S. Department of State, involving extensive discovery and motions practice and culminating in a three-week hearing at the CBCA. Represented training services contractor as an intervenor in the protest of a U.S. Department of the Navy protest at GAO, resulting in the timely dismissal of the protest and the affirmation of the contractor’s award. Protested the U.S. Defense Logistic Agency’s decision to reject a food services contractor’s proposal at GAO, resulting in the Agency taking corrective action by reissuing the underlying solicitation and accepting the contractor’s proposal. Conducted an internal investigation into a contractor's domestic preference compliance procedures, including compliance with the Buy American Act and the Trade Agreements Act (TAA), and counseled the client through mandatory disclosure obligations. Represented a major information technology provider in litigation against the U.S. Department of Defense in an appeal of a certified claim seeking costs associated with delays to an IT-based logistics program, representing the client through settlement negotiations triggered by a three-week mediation at the ASBCA. Defended a technology services contractor's termination for default at the GAOCAB, resulting in a conversion of the termination to a termination for convenience and the resolution of monetary claims against the government. Developed and prepared a certified claim for Prompt Payment Act interest relating to a contract for the supply of food services for the U.S. military in Afghanistan. Represented a contractor in the preparation of a request for equitable adjustment (REA) and in negotiations with the government in a dispute involving the construction of facilities in Saudi Arabia and the impacts resulting from the government's delays in providing approvals associated with the construction. Represented subcontractor in preliminary injunction proceedings regarding breach of teaming agreement in federal procurement. Counseled an IT services contractor that was terminated for default, and advised the contractor in negotiations that resulted in a no-cost termination for convenience. Negotiated an REA for costs incurred under a Foreign Military Sales contract. Developed and prepared a certified claim for costs associated with defective specifications relating to the construction of a new federal courthouse in upstate New York. Advised an aerospace contractor in a dispute with the U.S. Air Force regarding warranty requirements and alleged defects resulting from an engine maintenance contract. Defended a protest at the COFC of a U.S. Department of Defense aviation fuel contract, resulting in the Court’s denial of the protest and affirming the underlying award to the client. Represented a pharmaceutical contractor in multiple protests at the GAO challenging the U.S. Department of Veterans Affairs' decisions to set aside procurements for small businesses, resulting in a precedent-setting win for the contractor. Represented an occupational safety services provider in a pre-award protest at the COFC, resulting in the permanent injunction of a U.S. Occupational Health and Safety Administration solicitation. Represented a healthcare contractor in both a GAO and a related COFC pre-award protest of a U.S. Department of Health and Human Services Centers for Medicare and Medicaid Services solicitation. Represented a contractor in a GAO protest of an award by the U.S. Marshals Service for IT-based security services. Represented a financial services contractor in an agency-level, pre-award protest of a solicitation's unduly restrictive and ambiguous terms that prevented the contractor from competing on a level playing field. Litigated multiple North American Industry Classification System code appeals before the Small Business Administration's (SBA's) Office of Hearings and Appeals. Litigated multiple SBA size protests before SBA regional offices and at the SBA Office of Hearings and Appeals (OHA). Counsels commercial item contractors regarding compliance obligations, including requirements under Price Reduction Clause and TAA requirements. Developed FAR-based anti-human trafficking compliance policies and programs and provided training and due diligence support in the execution of the programs. Counsels clients regarding government contract domestic preference requirements, including the Buy America Act, the TAA and other domestic preference regimes. Counsels government contractors in connection with foreign ownership, control or influence issues. Conducts investigations and counsels clients in connection with FAR-based mandatory disclosure obligations. Reviews and advises clients on the formation and execution of teaming agreements and prime-subcontractor relationships. Counsels clients on the development of government contracts ethics and corporate compliance programs. Advises contractors on the formation of representative agreements, particularly in connection with foreign military sales. Conducted due diligence for a major defense contractor in the acquisition of a defense services contract, and counseled the client on potential organizational conflicts of interest and novation requirements. Prepared a response to a show cause letter issued by an Immigration and Customs Enforcement's suspension and debarment officer demonstrating the contractor's present responsibility. Counseled a large supplier of construction materials in the development and implementation of the Designated Business Enterprise compliance program, which included developing company procedures and training more than 3,000 employees in multiple states. Avery Coauthors "FY 2013 NDAA Passes Without Many of the More Controversial Contracting Provisions" for Bloomberg BNA "Federal Contracts Report"
Avery Authors "Obama's Executive Order Against Trafficking: What Contractors Need to Know" for Bloomberg BNA "Daily Report for Executives"
Served as a volunteer and coordinator with the District of Columbia Bar's Consumer Law Resource Center. Represented an individual in an appeal of a Social Security disability insurance benefit denial. Represented a client in a family law matter in District of Columbia Superior Court, which culminated in a three-day trial.